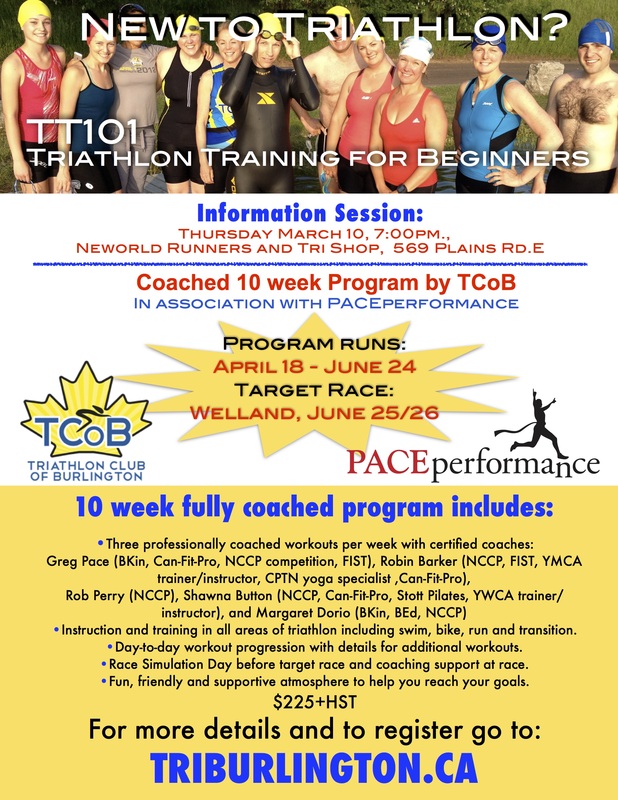 What: a coached 10 week program by TCoB NCCP triathlon coaches. When: Program runs April 18-June 24th. – Target race :Welland June 25/26. 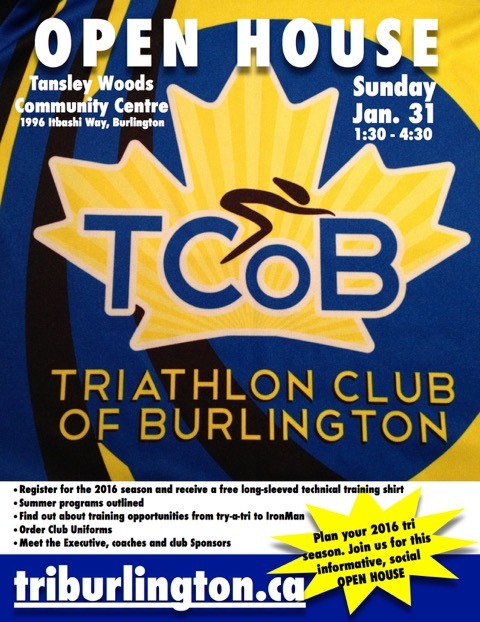 Come on out the the TCoB Open House, Sunday January 31st, 1:30-4:30 p.m. at Tansley Woods Community Centre, 1996 Itbashi Way, Burlington. Register with the TCoB for the 2016 season, and receive a free technical training shirt. Sunday Swims start January 4th 8:30-10 a.m.
Sunday swims run January 4 – May 15th, 2016 8:30 – 10:00 a.m. 16 weeks, fully coached. 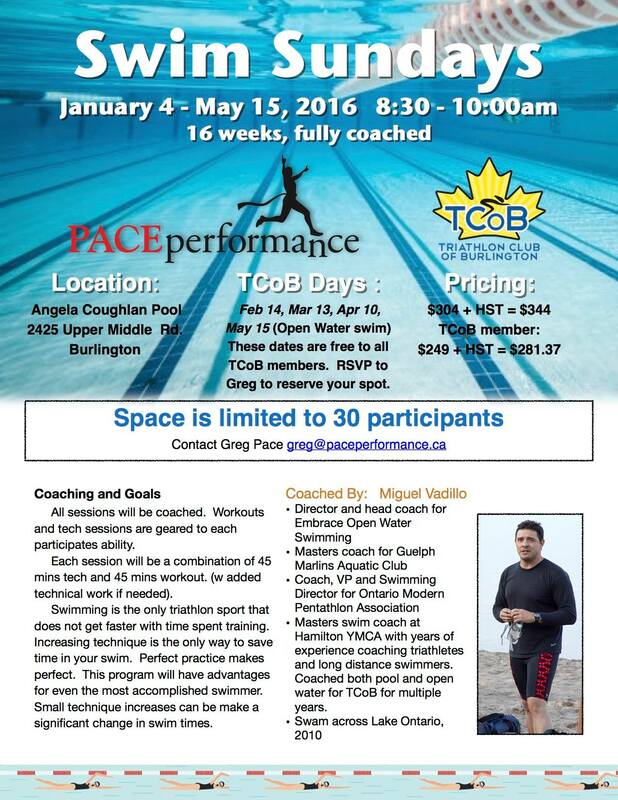 TCoB Days are Feb 14th, March 13th, April 10th and May 15th (Open Water swim). 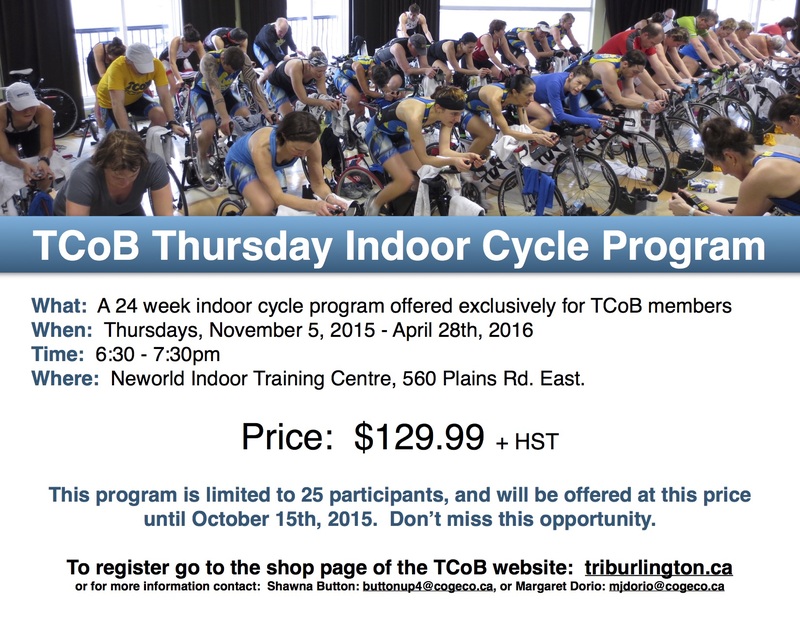 These dates are FREE to all TCoB 2016 members. RSVP Greg Pace to reserve your spot. Come join us for the annual Christmas Lights Run & Party, Monday December 21st. 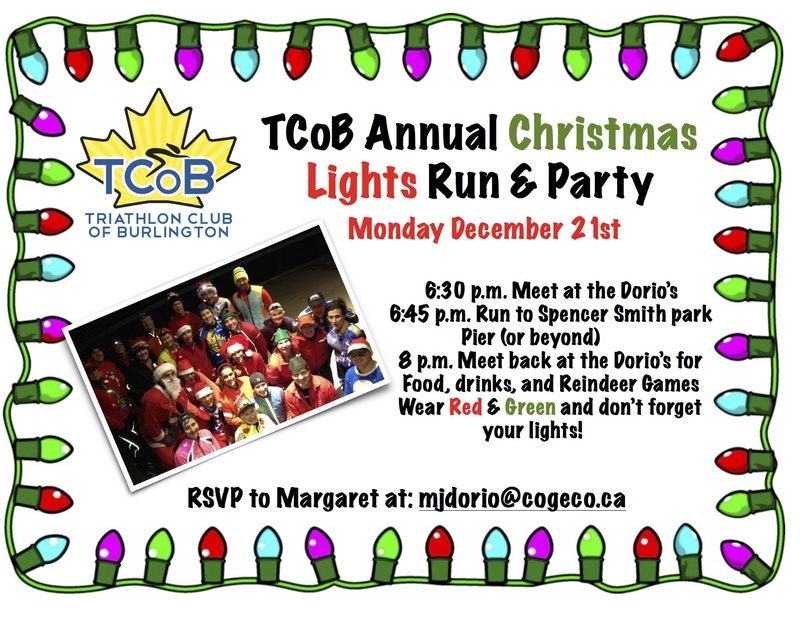 Meet at the Dorio’s dressed in lights and holiday cheer, run to Spencer Smith Park Pier (or beyond). Then meet back at the Dorio’s for food, drinks, and reindeer games. 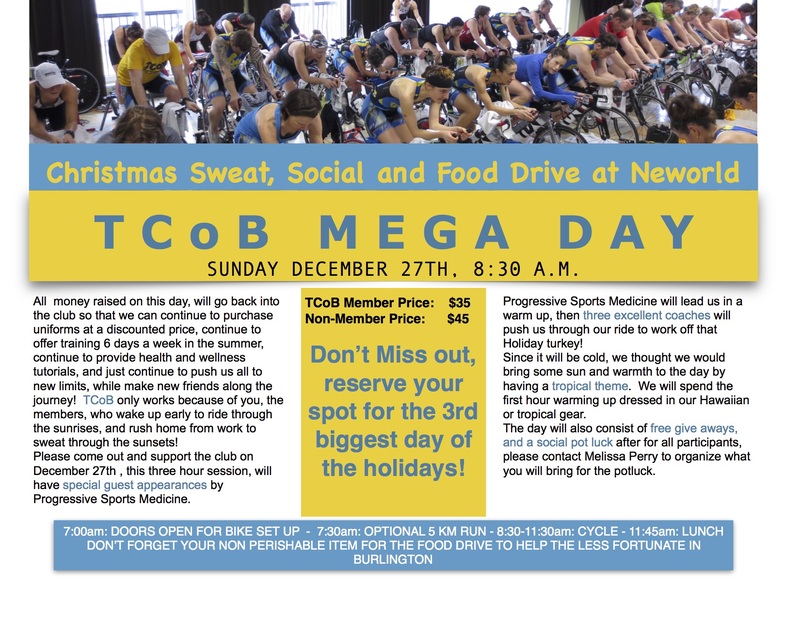 Come join us for our annual TCoB Mega Day – Christmas Sweat, Social and Food Drive at Neworld on Sunday December 27th 8:30 am. The Year End Banquet on November 7th was a time to celebrate the accomplishments of the club and its members. Congratulations to everyone for training hard, racing well and being active, this summer. Everyone deserves an award for pushing themselves beyond what they thought they could do. For many, that meant getting out to as many workouts as they could fit into their busy schedules. For others, it was winning their age category and for others it meant crossing the finish line at their first triathlon this summer. Emulating the attributes of the late Meredith Hagan, this athlete is a positive influence on all members both at workouts and races. They posses a vigorous, courageous and optimistic attitude. Their smile and friendly nature makes them a natural team builder and they help out whenever they can. Ken Alexopolus – after watching his wife Anna do well in triathlons, became very good at spectating. He has a very upbeat attitude and is very energetic and positive at races, taking lots of pictures and posting them on the TCoB Facebook page. Paul Goodrow – Paul, loves training with the club and has genuine interest and support for everyone. He knows how to quietly motivate, and will always be there with a supportive word. He showed up at the Muskoka Ironman and biked the bike course backward on a hybrid, so he could cheer people on and so he wouldn’t miss anyone. Sara Reimer & Rob Turnbull – Sara and Rob, are new members who from the very beginning had a warmth about them. They would come out to workouts, and races with their fold out chairs and their i-pad to take pictures, and cheer members on. Rob & Melissa Perry – Rob and Melissa are always there with a smile and willing to help, and motivate. Showing up at many races to cheer our members on and take pictures. Rob even drove the 10 hours to Mont Tremblant, just to cheer our members on, and show his support. Helene Desrosiers – Helene was riding fast in a group, when the group suddenly stopped, Hélène skidded losing control of her bike, while trying not to crash into the rider in front of her. She avoided hitting anyone else, but crashed onto the gravel on the side of the road. She had a cracked helmet, and a very sore elbow, but what had the most damage was her bike. I believe it is still in pieces. Gail Burgess – Gail broke her clavicle while she was racing in the ITU Grand Final Chicago. Imagine doing something like this while in a race you qualified for and while in another country! The recipient of this award has made marked improvements in their athletic performances this year and are a familiar face at many workouts. Their 100% effort is reason for their accomplishments. Melissa Perry – Melissa ran Into some issues when she stress fractured both shins and was in air casts for 5 months. After that her determination was evident. She didn’t let it get her down. She went on to complete 4 swim bike events, Welland, Guelph 1, iron girl, which was very difficult because it was changed to a run, bike, run. You can imagine how that would effect someone who couldn’t run. She also went on to finish Barrellman half Swim bike, showing her perseverance and strength. JD Farquhar – J.D. trains very hard at triathlon, completed 5 triathlons this past season, 2 half distance Triathlons, and 3 Sprint Distance Triathlons coming in 3rd in his age group in Guelph Lake 2, and top 9 in both Orillia, and Niagara Sprint distance races. Glen Innes – Glen is an accomplished cyclist, but never called himself a triathlete even though he completed an Ironman. This year he took triathlon seriously, losing a significant amount of weight, with a goal finish time in his head, he completed Ironman Mont Tremblant 2 hours faster than his previous Ironman, beat his goal time, and finally admitted he was a triathlete. Vanessa Gardiner – Vanessa started out in the So Tri program this past spring. She had a hard time running in the evening because of her breathing difficulties, but seemed to love the group and always gave her best effort. Vanessa also lost a significant amount of weight over the course of her training. She completed her first Give it a tri in Woodstock and came in 2nd in her age group. From there she seemed hooked, completing Orilla and Guelph lake 2 Sprint distance races. The recipient of this award is a new member to the club this year, as well as new to the sport of triathlon. They may have a strong background in one or two of the disciplines in triathlon, but this was their first year of competing in the sport. They have finished in the top 10, and/or on the podium in their age group in many races. All of these nominees share a new found passion for the sport of triathlon. Jon Robillard – New to triathlon his year Jon was a So Tri Participant and firefighter with Sam McLellan who told Jon about the TCoB. Jon had previous foot and shin injuries he had to overcome, but with his positive attitude and perseverance he completed 2 sprint distance triathlons, coming in top 10 in his age group in both. Kayla Bruce – Kayla was a SO TRI participant this year, coming to the sport of triathlon with a background in a bit of each of the three sports. Her natural ability as a runner, allowed her to place well (top 5) at both of her races this summer. Beth Deazeley – Beth has completed 7 triathlons this season, 3 half Iron distances, 2 sprint, 1 olympic, and is in Florida racing in her second Ironman in 2 months. She completed Ironman Muskoka in August in a time of 11:59, after being injured, and only running 10 km in the 2 months leading up to the race. Ken Alexopolus – Ken started out this season in the So Tri program, after watching his wife Anna do well in triathlons, he decided to give it a try. He was concerned about the swim, but over the course of the program progressed very well. His goal was to complete a tri-a-tri, and not only did he complete his first tri-a-tri, but he completed his first Sprint distance Triathlon this season as well. Wendy Fretz – Wendy has spend countless hours on membership for the club, she even went out of her way to help members get their T.O. forms in a pinch. She has been a big contributor of information and advice to both Margaret and myself. This person is my running partner, friend and is full of wisdom. She has given her time, her knowledge, and input. Last year she was terribly injured, and couldn’t race at all, but this past season she has shown her strength and determination, completing her 1st triathlon, Muskoka Ironman 70.3. After this race she decided to do her 1st full Ironman. With only 1 month to train before tape, she jumped into the longer distances and completed Ironman Muskoka. This member consistently places on the podium for their age group in races. They possess attributes such as positive attitude, perseverance, drive and determination. They are and an active member of the club, participating in workouts and special events. The recipient of this award always strives for the best and gives top effort. Kevin Brady – Kevin Brady – Started the season with the Milton sprint placing 4th in his a.g., Then completed the Muskoka Ironman 70.3 swim/bike, but because of an injury couldn’t run, this didn’t stop him, he came back to place 4th in his age group in the Magog Sprint triathlon, and finishing off the season with the Bracebridge sprint placing 4th in his age group. Mike Haslam – Some of you might or might not know, Mike became a grandfather this past August. He is also a very accomplished triathlete. He raced the Welland Half placing 3rd in his age group, Ironman Muskoka 70.3 placing 4th in his a.g., Niagara Sprint 3rd in a.g., Orillia Sprint placing 2nd in his a.g. Raced in the ITU Grand Final in Chicago, and Ironman Louisville on October 11th, placing 5th in his age group finishing in an impressive 11:21. Paul Allingham – Paul who is in the age 70+ age group races almost every single weekend, and always placing on the podium. A couple of weekend this summer he raced both Saturday and Sunday. He is also a proud Papa who has been able to get his family involved in triathlon. Both his daughter and grandchildren race in triathlons with Paul. He started off this season racing Ironman Muskoka 70.3 placing 3rd in his a.g. Then he raced Gravenhurst Olympic 1st in his a.g. and Gravenhurst Sprint on the very next day placing 1st in his a.g. he raced Magog Olympic placing 2nd in a.g. Raced in the Aquathon, Sprint and Olympic races in the ITU Grand Final Chicago, and Ironman Miami 70.3 on October 25th placing 2nd in his a.g. and qualifying for the 70.3 World Championship in Australia (Mooloolaba on the Sun Coast) next September 2016. Chris Jocelyn – Chris competes and finishes consistently on the podium, even though he is in one of the biggest and toughest age groups. He is a natural runner, If you watch him run he looks very relaxed, in his element and he’s fast. He ran the Around the Bay 30 km in 1:55, placing 4th in his age group. He completed Ironman Mont Tremblant in 9:57 qualifying him to race in the Ironman World Championships in Kona October 10th, finishing this very tough, windy race in 10:47. Claudia Hutchinson – Claudia is a race ninja. What do I mean be that? She is dedicated and can overcome challenging obstacles, skilled at her trade like a ninja. She keeps herself hidden, never boasts and never complains, like a ninja. Extremely disciplined, she carefully executes her training plan leading to real results, like ninja. She usually travels in a group racing with her family, like a team of ninjas. Alright enough with the ninjas, Claudia is strong willed and courageous athlete who worked very hard to make it to top. Chris Walsh – Chris Walsh has this amazing easy going attitude, nothing can get her down. It makes her a joy to be around and she can always make her training companions laugh. Chris’s race season was truly out of the ordinary; there were shark invested waters and miserable British rains closing with the honour of representing her country. Chris is the best training partner for both her attitude and skill. Tanya Hewson – Tanya has become a quite the triple threat. You might be thinking that I mean she is incredible at this swim, bike, run thing and well you would not be wrong, it is not where I am going. She has heart, mind and spirit. Her heart is expressed through how she cares for all her teammates. She never passes one of us in practice without a friendly cheer and if you are actually passing her, she cheers you all the same. Her mind is tough, probably the toughest thing about her. Injuries and expectations managed with intelligence and experience. Her spirit embodies how I hope all of us can race. Her spirit always lets her find and enjoy something completely special in each race. If you haven’t read any of her race stories on FB, you should. Tanya executes racing with skill as an athlete and as a beautiful person. Hélène Desrosiers – Helene Desrosiers is an athlete I have admired since I joined TCoB. She is world class in more ways than her swimming, biking and running. Her talent is only surpassed by her kindness. 2015 started out as every other year, the Boston Marathon. This experienced athlete has a tradition of breaking the rules. She always buys new clothes and shoes for this race, for her its not nothing new, its everything new. As the triathlon season came and went, I wonder if she got deja-vu. Does that happen when you win the Tremblant half and then the full again a couple of weeks later? And does deja encore vu exist? With the Tremblant full being so hot leading to one of the hottest Kona’s on record. Through all the challenges she remained modest and humble. Through the bike crashes and scotching heat you can always count on seeing a smile on her face. Gail Burgess – Gail has been addicted to the podium since she started doing triathlon. This year she fed that addiction well. Small gains are usually what experienced athletes have to work very hard to achieve. But there is nothing usual about Gail, she is exceptional. Part of getting to the podium included nearly 5 minutes of improvement in her half ironman swim time. Gail is a serious competitor doing everything she can to her gain advantage. Although this season might not have ended as she envisioned, she is a club hero and the ultimate pace performer. Super Saturdays – a workout for every Saturday of your winter. There is something going on every Saturday this winter…. Keep fit, and have fun with your fellow TCoBers with a variety of workouts. 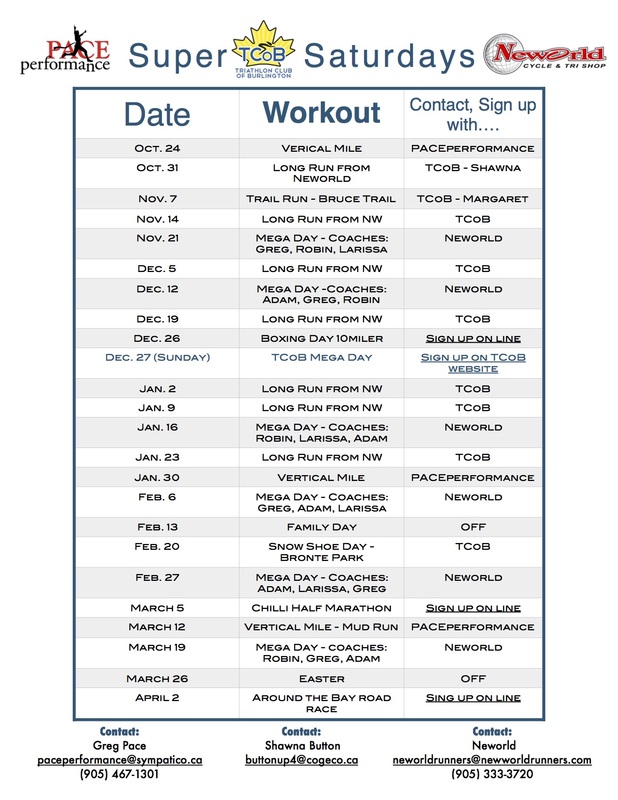 Vertical Miles organized by PACEperformance, Mega Days organized by Neworld, and long runs and special workouts organized by TCoB. Contact information attached. Hope to see you out there!! I completed that Miami 70.3, finished 2cd in my age group and took the qualifying spot for the 70.3 World Championship in Australia (Mooloolaba on the Sun Coast) next September 2016. I have a mixed review of the race. I did very well in both the swim and bike portions but poorly in the run. The day started good weather wise, about 80F and overcast and not quite as windy as earlier in the week although still pretty breezy. But the temperature rose to about 90F with 80% humidity as the sun came out for most of the run. Water temperature for the swim was 80F and not wet suit legal. And they started warning of jellyfish at the start and encouraged those who had allergies or were in any way fearful to wear wet suits, start in the last wave, or only do the bike and run portions – of course you would get no official time or qualification if you did any of these. My swim went well in 38:52 including a 2 minute run to transition before the timing mat. Salt water does help buoyancy and speed and I mastered keeping the salt water out of my mouth while breathing as it made me nauseous. But I kept feeling “niggled” and tingly on my bare arms and shoulders during the swim. I thought it was weeds as there were a lot to swim through in parts but later realized that it was also jellyfish tentacles that were stinging me somewhat. I even bumped into a couple that I could feel. I didn’t really suffer but did take the volunteers up on the offer of being sprayed with some kind of medication or disinfectant when I got out of the water. The bike course was pretty flat out and back but the wind was behind us going out and a headwind coming back. It went along an eastern part of the Everglades west of Miami for a bit but I saw no alligators. (I did see some yesterday at the Kennedy Space Centre Tour.) Averaged 34kph going out and 26kph or so coming back as I tired somewhat into the wind. Time was 3 hours 5 min including T-2 and beat my buddy Derek by a minute although he stated 2 minutes ahead of me after the swim. Then onto the run where the heat and humidity did me in. I really tired and probably either dehydrated a bit (although I drank 4 1/2 bottles on the bike and at every water stop on the run) or suffered a bit of heat stroke. I had sunscreen on but still go burned a bit as it wore off. I ran and walked a bit on the first loop and then pretty much walked the 2cd loop. Slowing quite a bit a the end and I threw up 2 Km from the end and rested a bit on a bench. My old nemesis. Derek beat me by and half hour overall but 2cd place for me was OK on the day and since he didn’t take the Australia spot for our age group I got it it. That will be 2 nice trips next year including the Italy 70.3 in June I registered for earlier. A great 50th anniversary year for travel with Joanne (and races he says quietly). Finally the season is over and now just light training for a month or two and then it begins again for next year’s race season. We all ride bikes. And we all have our reasons. We’ve been to bike shops where we examine the merchandise. We inspect, we question, we judge. We want a fast bike. We want the perfect bike for us. But is ours the only story? Is there another untold tale? Yo!! You bet there is! Hey, I’m glad I finally get to tell the real story. My friends call me Trekky. You see, me and all my friends are bikes. Yeah, I’m a bike…a fast bike…a really fast bike. But I’m jumpin’ ahead. It all started one day at the bike shop – a pretty cool bike shop actually– nothin’ but serious bikes for serious riders. Me and Felty and Canon and Cervo and all the other bikes on the floor – you gotta know we spend all our time lookin’ you guys over when you come in. What? You don’t think we do to you what you do to us? And you should hear what we say about you!! You see, we’re lookin’ for the perfect rider … you know, young, fit and strong. Someone who can make us do what we were made to do. So one day this older guy – you know, lotsa snow on the roof – starts snoopin’ around. We’re like “Whoa grandpa, you lost? Can’t find Canadian Tire?” Then to my horror, he picks me out! And our sales guy’s starts tellin’ him all my features, like how light and aero I am, great on hills and in the wind, all the usual stuff. “Ok, I’ll take it” he says… and I’m like “S**t, my life is over and it ain’t even started”. And my so-called friends are all ”Yo, Trekky, you’ll look great with a basket” “Watch out Trekky, he’ll crash you and turn you into a walker”. “At least you’ll be the fastest walker at the home!” Yeah, real funny guys. Next day my rider takes me out for a spin, to get used to my feel and my peddles he says. I’m like “Please don’t tip me over. Don’t crash me. Please, please, please”. Then to my surprise, he starts to ride me like he almost knows what he’s doin’… shifts my gears kinda smooth, doesn’t grind me, clips out at stops, handles me okay. Maybe it’s just the country air, and sense of motion. Or the honesty and the purity of it all. You know we can’t go anywhere where he doesn’t make it happen… with real, actual effort, not just pressin’ his big toe on a gas pedal. And how he loves all the speed I can give him. And the danger! The more the one, the more the thrill of the other. If you ask me, I think he’s addicted! One day we’re doin’ hill repeats. I’m takin’ him up just like I’m supposed to, and he’s resting goin’ down, just like he’s supposed to. Then I hear him say to the guys “I’m going to open it up on the descent. See how fast we can get it going”. I’m like “you sure?” cause I know how fast we can get me goin’. And it’s not called Snake Road for nothin’! We approach the first turn and I’m “Ah s**t, we’re goin’ into the guard rail. But he leans a little more and he keeps me just on the edge of the road. I’m sweating the oil off my chain!! Then he heads to the centre line for the next turn, takes me to high gear, and then really leans. If he so much as looks at my brakes, we’re down and I’m scrap. But he keeps peddling. Every turn, we’re Right…On…The…Edge! I’m thinkin’ either he knows what he’s doin’, or he’s freakin’ crazy. We make it to the bottom and he starts screaming “yes, yes, yes”. I know how fast we’re doin’ and decide yeah, he’s a little bit freakin’ crazy. Well, it’s been a whole season and I’ve been thinkin’ about how we started and what we’ve done together. And what I’ve learned. You know, you just can’t tell by lookin’ how much heart someone’s got. Or what kind of an engine they’ve got. Or how much kid is still left inside. Join the group for this 24 week cycle program this winter. Stay connected, stay in shape at this one hour high energy workout.